You would be forgiven for thinking that eighty-four year old screen veteran Robert Duvall is slowing down with his cinematic work. You would also be wrong in thinking this. Since his Oscar nomination for his supporting turn in the otherwise average The Judge, Duvall has taken a role in James Franco's Steinbeck adaptation In Dubious Battle - as well as teaming up with the actor in his own film, Wild Horses. Duvall's leads, writes and directs this contemporary Western which serves as his fourth feature project as director. Duvall and Michael Shell's narrative follows Detective Samantha Payne (Luciana Duvall) as she reopens a missing persons case in small-town Texas. 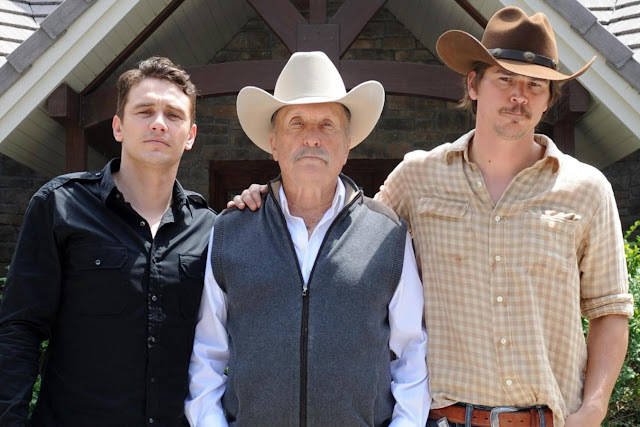 Her chief suspect is local rancher Scott Briggs (Duvall) whose tempestuous relationship with his gay son Ben (James Franco) and sibling KC (Josh Hartnett) makes him ripe for investigation. Wild Horses is admirable in the new ground it breaks. There's something inherently old-fashioned about Duvall's style of subtle filmmaking and the settings in which his stories are told. The suspect Western patriarch angle is by no means fresh, but becomes so when combined with the gay dynamic in this surprisingly progressive tale. The film's prologue opens with Scott's disgust and violent outbursts after discovering Ben and the soon-to-be-missing Jimmy Davis embracing, Ben is soon kicked out the house. As the narrative progresses and Ben returns, Duvall and Shell take time to capture the evolving relationship of Ben and his father, with the latter becoming more acceptant to his son's lifestyle. Within this dynamic there's still intrigue as to what happened to missing Jimmy Davis and to what part Duvall's character was part of this. There's complex character emotions at the heart of this piece which combines Southern family drama with the detective mystery. This allows for some evocative direction and cinematography from Barry Markowitz who captures the small-town Texan atmosphere in its open plains, rickety bars, and sun-baked ranches. Well-crafted characters ensure there's some strong performances to enjoy. Duvall's lead turn is a pained and complex performance - whilst Scott appears somewhat repentant about his treatment of son Ben, there's also a curmudgeony sense that Scott couldn't give a damn who he offends. Franco's supporting adds some impressive depth to Ben, with the actor's real life fascination with gay-life shining through in this unashamedly proud turn. Hartnett has less to do here than his on-screen sibling but nonetheless is a welcome presence. Luciana Duvall's performance feels somewhat shakier with line-readings often appearing stilted and unnatural. Duvall's sense of plotting can be occasionally confusing and could have benefited from sharper editing. Attempts to weave multiple subplots into the fold - including corrupt deputies (featuring unnecessary car chases and shoot-outs) and family wills - detract focus from the mystery at the heart of the piece, whilst watering down the impact of the fractured Southern family dynamic. Wild Horses is an impressively progressive picture from Duvall. In its frank discussions of gay life in the 'Western' setting, it breaks new ground, whilst there's enough mystery and intrigue found within its detective angle to engage throughout. Subtle direction and magnificent lead turns from Duvall and Franco ensure this is a film steeped in realism - and is all the better for it.